One of the things I love about working with Dan Hodge is that he has such a fluency with Shakespeare that when he proposes a change to the text or, in my case, a change in character gender, it’s a well-considered and weighed decision, and so well executed that you’d be hard pressed to convince me it wasn’t what Shakespeare intended all along. So the decision to make Horatio a woman was not an arbitrary one. 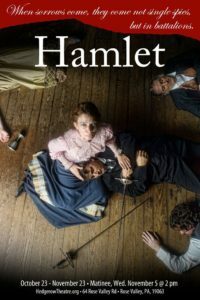 The beautiful thing about Horatio’s relationship with Hamlet, and what attracted me to Horatio as a character when I first read the play as a kid, is that what they share is a deep and trusting confidence and comraderie, so the jump from male to female is perfectly natural, particularly if you set the play in a different century, as we do here. So, on the one hand, nothing had to be “re-written” or added to make the transformation complete; Hamlet simply has a best friend who is a woman. However, as a woman speaking Horatio’s lines, the emotion lying under those words of friendship and fidelity becomes much more fraught and infused with a tension not necessarily present if Horatio is a man. Horatio’s position as outsider at the Danish court is also much more apparent, for although the setting has been updated to the first years of the 20th Century, views of women, and professional women at that, are far from modern, so the loneliness and isolation of Horatio when Hamlet is not at court and the sense for me that Hamlet may be the only true friend, male or female, Horatio has, even at Wittenberg University, are palpable. For me, this adds significantly to the tragedy of the play and the sorrow of the final tableau. I truly am alone. As an actor, the most difficult challenge is in bringing life to Horatio as a woman, complete with the underlying, tacit emotions, but maintaining the character traits given to her by Hamlet when he tells her she is “not passion’s slave.” There’s the desire to hand the audience every nuance and have them see Horatio’s soul from every angle, but in the end, that is the joy of rehearsal: discovering the limits and possibilities within this world we’ve found.